In Ghana, he’s royalty. In Worcester, he’s just Harry. Harry Danso wore traditional garb at a gathering Saturday of Ghanaians at the Southbridge Hotel and Conference Center. WORCESTER — Harry Danso is flipping burgers at a backyard cookout, his smiling face lost in a billowing cloud of smoke. In his polo shirt and jeans, he looks like any other weekend grillmaster. Nearby, a woman takes in the summertime scene with a knowing laugh. “He would not be doing this” in his homeland, she said. In Ghana, he is royalty. Danso is known as Nana Awuah Panin III in his native country. One of scores of royal chiefs there, he wears a gold crown and colorful kente cloth, resides in a palace, and rides around town with a chauffeur. But in Worcester, he is just Harry, a middle-aged middle manager at an endoscopy company who paints his own deck and gently discourages his Ghanaian coworkers from calling him “nana.” the word for royal chief. Ghanaians are the largest single group of immigrants in this Central Massachusetts city, and some say they are advancing quickly because they speak English, emphasize the importance of higher education, and form close-knit societies that are often guided by chiefs, an ancient role that has evolved in the United States. New York has the highest number of Ghanaians in the United States, with more than 30,000, but Massachusetts has become home to roughly 7,000 over the past two decades, most of whom live in Worcester, according to Census figures. 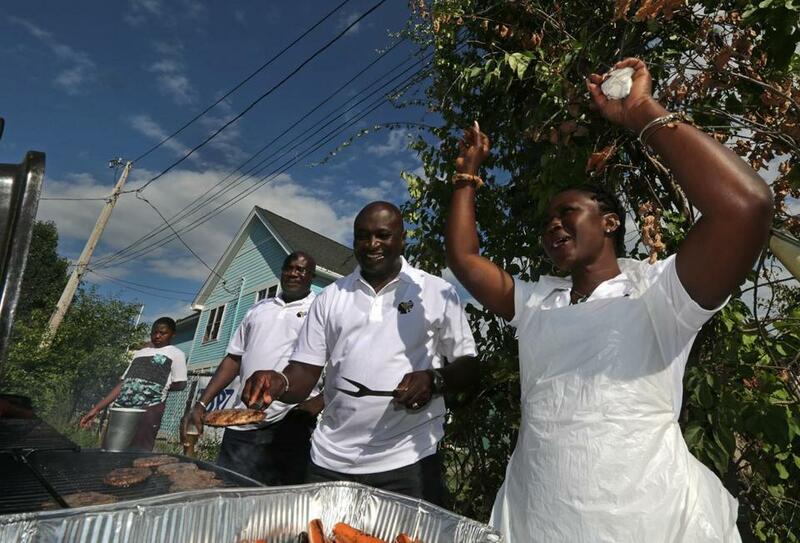 Harry Danso joined a cookout with coworkers in Worcester, where the royal chief from Ghana has built a life that includes helping immigrants from his homeland adjust to America. While elected officials govern Ghana, royal families are among the nation’s oldest institutions, having survived British colonial rule, the country’s independence in 1957, and a chaotic, coup-ridden path to democracy. Royal titles vary, but chiefs seek to promote stability and foster development in a nation that despite tremendous strides still contends with poverty, infant mortality, and high inflation. 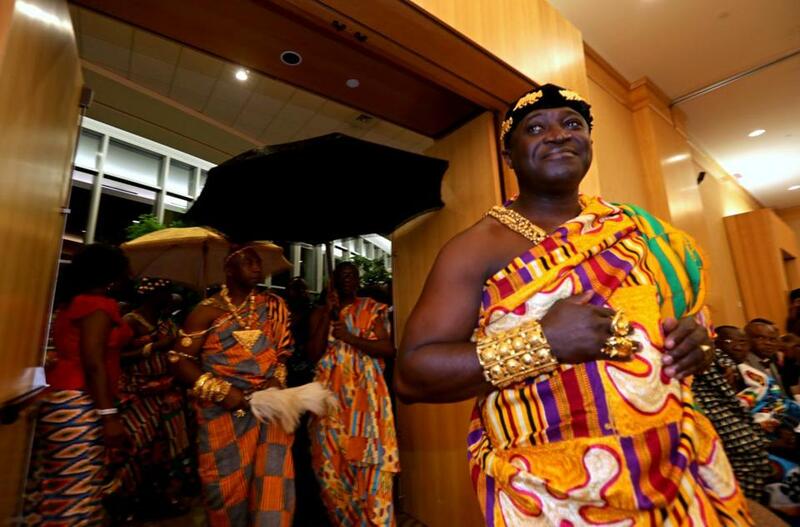 Danso, who came to the United States in 1985, is a descendant of the Ashanti people, one of Ghana’s largest ethnic groups, and he is a chief in the Asokwa area, which includes his hometown of Koforidua. Danso sends money home to pay his relatives’ school tuition and to support cocoa production to create jobs. He and other Ghanaians in Worcester raise money through a nonprofit, the New Juaben Association of New England, to send X-ray machines, gloves, and syringes to the area’s cash-strapped hospital. 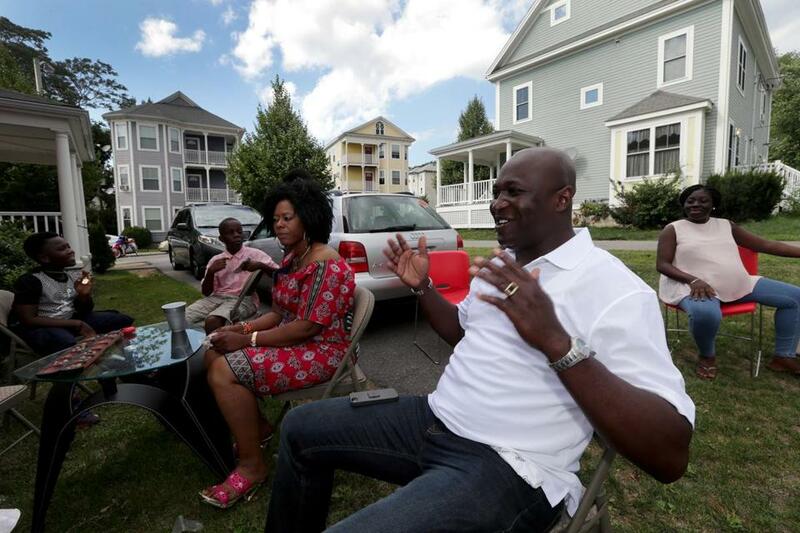 In Worcester, Danso plays a different role, serving as a counselor and guide for immigrants. He teaches them how to find jobs, deal with landlords, and contend with discrimination. In 2011, he was named to Worcester’s Human Rights Commission, a city agency that seeks to ensure that all residents are treated fairly. In Ghana, neighbors can ask Danso for help but cannot address him directly at the palace. Instead, they must speak through a linguist. At his Worcester home, Danso speaks with his compatriots directly, unless he is on his throne — a Victorian chair with barley-twist legs by his fireplace. Visitors arrive at his beige ranch house with libations, usually a clear drink such as vodka that is poured to summon their ancestors. Immigrants often come looking for advice on adjusting to life here, he said. In Ghana, for instance, men pay all the bills. But in America, women are expected to chip in. Other countrymen come seeking his counsel about buying homes or handling divorces. When he left for America in the 1980s, a time when more than half of Ghana lived in poverty, Danso knew he could one day become a royal chief and possibly one of the kings of Ghana. But other men in his family were ahead of him, so in Worcester, he built a new life. He graduated from college, married, had children, and bought a home. Then early one morning in 2003, his uncle called from Ghana. Another uncle had died, and the family wanted Danso to succeed him as royal chief. His cousins had declined, but Danso said he accepted without hesitation. Serving as chief is a demanding job, he said, especially from so far away. He returned for the induction ceremony and sometimes visits several times a year. But his job and his four children are in Massachusetts now. Harry Danso manned the grill at a cookout for a networking group of African Americans from his workplace. On a recent day off, for example, Danso’s cellphone rang repeatedly. Visiting dignitaries from Ghana were searching for a hotel in Massachusetts. A tenant was asking for help because her apartment was infested with mold. His calendar is almost always booked with funerals, parties, and meetings. But it was an event last Saturday night that showed best what Danso’s life becomes as Nana Awuah Panin III. In brightly colored dress, hundreds of Ghanaians from Canada and across the United States poured into a Southbridge hotel for a $60-a-person fund-raiser to build schools in Brong Ahafo, a region in Ghana. The featured guests were the first lady of Ghana and the highest ranking king from the region, and Danso was among the high-ranking chiefs. When the first lady was escorted into the ballroom, the crowd applauded politely. But when the king and other royals, including Danso, started their procession, the room erupted. Drums pounded, and elaborately decorated umbrellas twirled overhead. Everyone strained for a view of the king. “He’s the soul,” said Samuel Tandoh, a social services worker from Denver. Kwamina Panford, a Northeastern University professor originally from Ghana, said Ghanaians trust royals such as Danso because of their commitment to public service. “Harry, he has earned it,” Panford said in an interview.